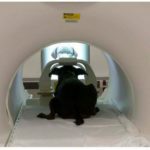 The Emory-CPT canine fMRI research team’s recent project obtained attention from Coren due to his interest in visual processing and human-canine interaction. Coren lauds how the Emory-CPT team became the first researchers to definitively demonstrate an explicit facial processing area in the canine brain. Coren discussed the uniqueness and difficulty of the canine fMRI process developed by Berns and Spivak, the methodology of the experiment, the results of the experiment, and the importance of the experiment. Coren was excited to learn that the results discovered that the subject dogs’ facial processing area activated not only to canine faces, but also to human faces! The preceding fact, most likely due to a concept called coevolution, explains how dogs can adeptly follow human social cues delivered via facial countenance. Moreover, in accordance with the precepts of coevolution, humans would be more likely to breed dogs that were more highly adept at interpreting human facial communication. The information gleaned by the team provides new insights into canine visual processing and the canine mind. More importantly, the findings may lead to advances in training and behavior modification techniques that emphasize or employ human-dog communication methodologies.